I’m sure we all know by now that I can’t stand the cold for too long so I’m sure it doesn’t come as much of a surprise when I say that I’ve already booked my next trip; I’m off to Mauritius this winter and I cannot wait. While my itchy feet don’t like to stay on British soil for too long, they also don’t like to be in the air for too long either although I’m sure the 12 hour flight will be more than worth it. With all intents and purposes, I intend to get off the plane feeling refreshed and looking the best version of my 12 hour self possible. These are the long haul flight essentials that I’ll be taking with me to keep me hydrated, moisturised and generally refreshed while I’m in the air. The first is an absolutely fabulous kit from relatively new skincare brand Air Repair which was founded by a licensed aesthetician and avid traveler, Denise Spanek who noted a gap in the market for skincare products that specifically target the harsh environmental stresses on the skin that are caused by climate changes and flight fatigue. 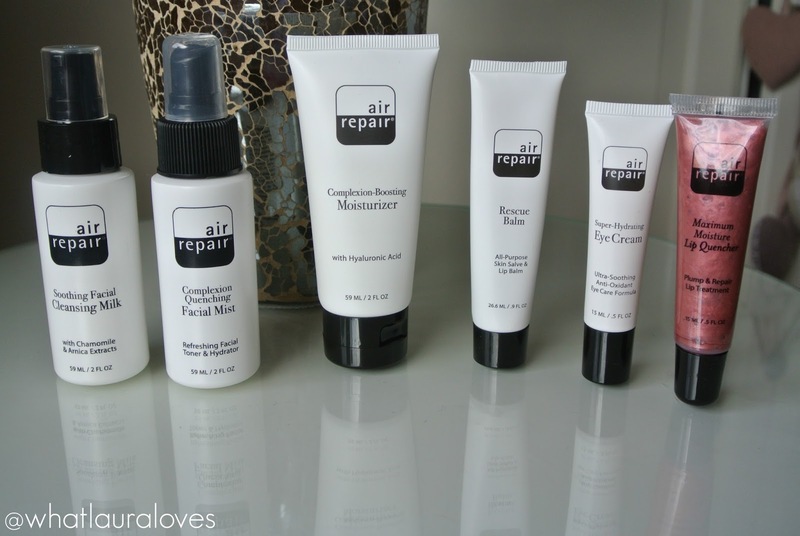 The great thing about Air Repair skincare products is that they’re all made in the USA and are cruelty free. 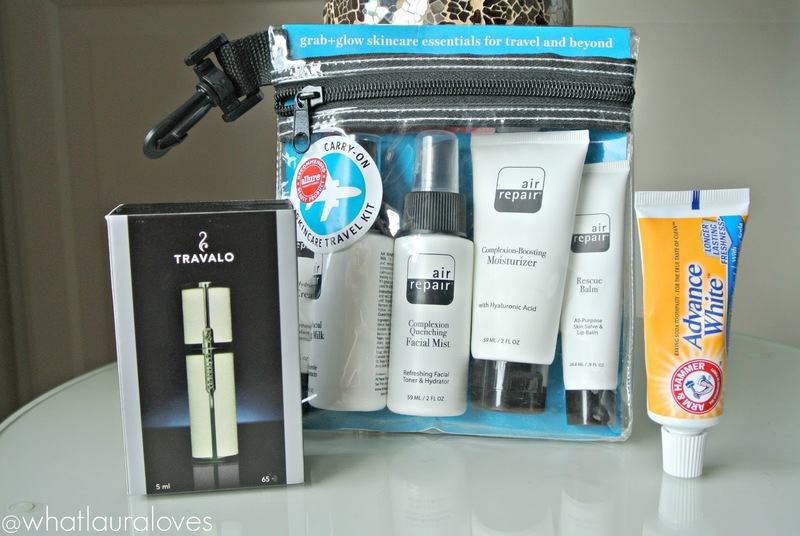 The Air Repair Kit is a 5 piece kit of Grab and Glow Skincare for Travel and Beyond. It comes in a very sturdy zipped bag that complies with airport regulations to you can pop it into your carry-on bag or clip it onto your hand luggage. Plus all of the bottles inside are under 100ml so you can sail through security with them. All of the products are designed to combat skin issues from flight fatigue to daily environmental stress by using targeted ingredients to soothe and heal the skin while restoring its health and radiance. they’re not just designed for use on the plane as you can use them when you get to your destination too which is great news for those who like to pack a lot as the one area you’ll not be overpacking is your skincare. Whenever I travel, be it short or long haul, I like to go to the airport makeup free so I’ll be using the Air Repair Soothing Facial Cleansing Milk with extracts of Chamomile and Arnica in the hotel bathroom before we leave to remove my makeup if I’m wearing any and to cleanse my skin of any dirt if not. Then I’ll be using it while I’m away to take my makeup off. It breaks down makeup nicely and doesn’t leave my skin feeling tight or dry afterwards which is so important as I often find that the air-conditioning on flights drys my skin out something rotten so I don’t need my cleanser to do that as well. Once the flight takes off, I like to complete a mini skincare routine at regular intervals to keep my skin feeling super hydrated and moisturised. Usually I’ll start with a face spray so the Air Repair Complexion Quenching Facial Mist will be perfect. It is a very refreshing facial toner and hydrator that you spritz directly onto the skin. The formula includes Hyaluronic Acid which helps to bind moisture to the skin which is exactly what you need on a flight as the air is so dry and Aloe Vera Gel which cools and soothes the skin which is great if your skin is irritated by the air and its drying effect. After I spritz my face, I always follow up with an eye cream and the Air Repair Super-Hydrating Eye Cream from this kit is brilliant because it has a cooling and soothing effect on the eye area. I’ve been tapping it into the skin using my ring finger and find that it is absorbed quickly into the skin and because it is quite lightweight, it doesn’t feel as though it is overloading the delicate skin around my eye. It is packed full of awesome ingredients from soothing aloe and allantoin, antioxidant rich vitamin C, green tea extract and cloudberry sees oil. It really makes my under eyes feel and look visibly hydrated which I know I will really appreciate when I get off that super long flight. Following the application of my eye cream, I then always apply my moisturiser and this kit has one included too. The Air Repair Complexion Boosting Moisturiser helps to repair dull, tired and dehydrated skin by giving it a boost of humectants and antioxidants including Cloudbery Seed Oil and Green Tea, Hyaluronic Acid, Pathenol and Heat Shock Proteins to repair and rejuvenate skin that is looking stressed and inflamed. It feels light weight on the skin yet incredibly moisturising. Like the eye cream, it is relatively quick to be absorbed and leaves the skin looking and feeling instantly hydrated. Usually at this point, I would complete my skincare routine with a slick of lip balm however this kit contains the Air Repair Rescue Balmwhich is their hero product. I’ve been trying this out since the cold weather has hit and it is absolutely brilliant. Essentially it is a 100% natural multi-purpose balm that you can use wherever you have dry skin. 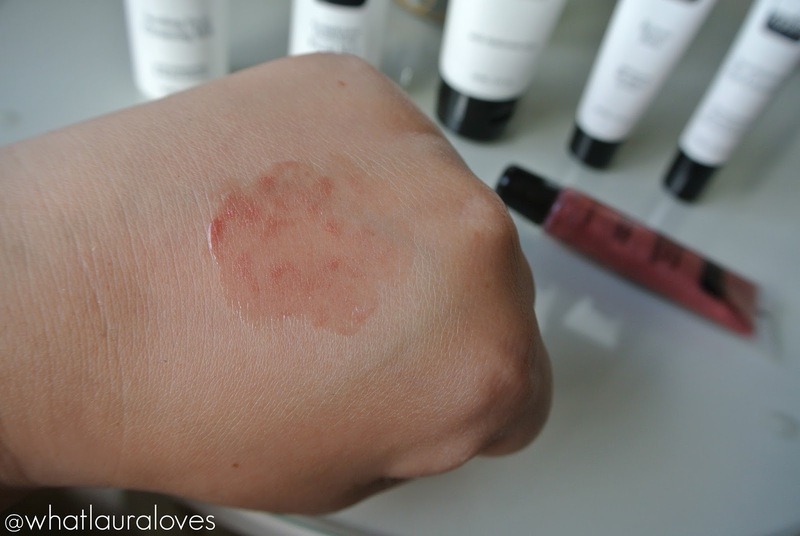 I’ve used it on my lips as an intensive lip balm and on my hands and wrist. I get really dry knuckles and a patch of psoriasis on my wrist during the cold months and this balm really soothed my skin by making feel hydrated and continuously moist without being greasy. I think this will really help me when I’m in the dry environment of the aeroplane and when I get to my destination. It actually reminds me of a much better version of the Elizabeth Arden 8 Hour Cream. One of the things that I love about this kit is that it is completely unisex from the packaging right down to the contents inside so I can share the products with the person I’m travelling with and they should work really well for their skin too. While I have tried this kit out before my flight so that I could share it with you on my blog, theres still plenty left for my two long haul flights and my holiday as they bottles are really generously sized. However after trying out the set and seeing for myself how gentle they are on the skin, as they’re free of petroleum, parabens and mineral oil, I’m confident that this is a kit that you could just grab and go without trying it first. Each product has been designed for use in all climates by any skin type, even sensitive skin. Another product that I’ve been trying out from Air Repair ahead of my holiday is the Air Repair Maximum Moisture Lip Quencher. The idea behind this lip product is that it works as a treatment for the lips as well as a cosmetic to add a touch of colour. It helps to nourish and heal dry or irritated lips with the Grapeseed Oil, Vitamins C and E and Hyaluronic Acid in the formula. The Hyaluronic Acid also helps to increase water retention in the lips to give them a plumper appearance without that awful irritating sting that some lip plumping products have. I will be getting my lash extensions on and having my brows tinted before I fly so I’m looking forward to being able to step off the plane with just a slick of this juicy pink lip colour on and maybe some big sunnies looking fresh faced and ready for a relaxing break in the sun. My second long haul flight essential has to be a Travalo. I have been using these for years and years as they’re an absolutely superb way of being able to take your fragrance with you when you’re on the go without having to carry the whole bottle with you. This is the new luxurious Travalo Milano which is their most sophisticated and opulent refillable, portable fragrance spray to date. I love all of the Travalo models but this one has to be my favourite because the quality is superb and it looks really stylist. It is made of a heavier metal than the others and is available in eight different colours. I have the white which looks so chic and I picked it out because I thought it would go with any of my handbags. I’m loving white accessories at the moment! The Travalo Milano is so easy to use; simply pick out one of your perfumes before you travel, remove the cap and pump the perfume into the Travalo. It is quick and easy to do and the patented Genie-S pump-fill system ensures that the fragrance isn’t contaminated by exposure to the air. 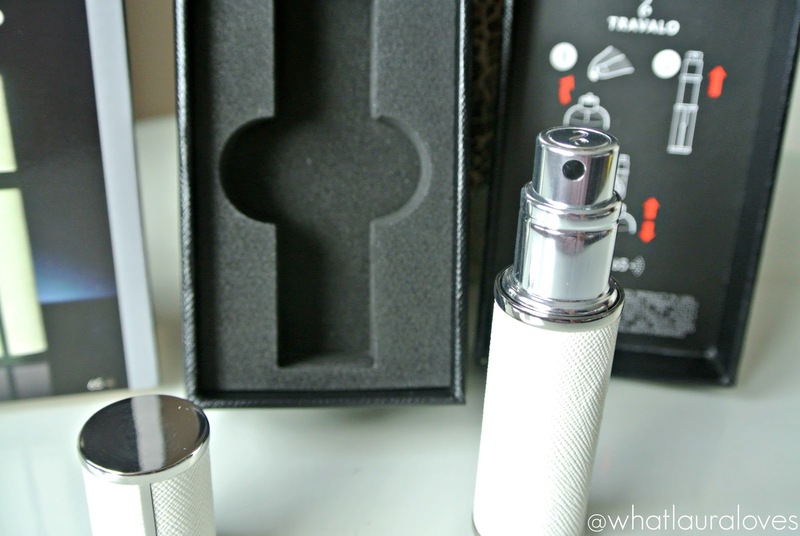 The great thing about the new style Travalo is that it contains a pioneering spray head that produces a really fine mist to disperse the perfume over a larger area super efficiently, so you’re able to use your precious perfume more sparingly. Not only that but Travalo have made the inner bottle removable and interchangeable with their ‘uchange’ system. This enables users to switch out their fragrance without having to wait for their Travalo to run empty which is a great idea for people who, like me, like to change their scent regularly. This particular Travalo is 5ml and holds 65 sprays of your favourite fragrance. Not only does this give you more than enough for a few spritzes a night on a two week holiday but it also means that you can keep it in your hand luggage back while you’re going through security. When you’re stepping off a long haul flight, the last thing that you want is to be smelling unclean so using a Travalo is a great way to freshen up. Mine are an indispensable part of my handbag regardless of whether I’m travelling or not because they’re so convenient and enable me to freshen up and smell great on the go! The last long haul flight essential has to be a mini sized tube of toothpaste. It doesn’t matter how much gum I chew or what I eat, whenever I’m coming off a long haul flight, my breath always smells pretty bad. I know I’m not alone in thinking this as other people who I’ve travelled with have all said that they have the same problem when they travel. The only way to combat this is going into the bathroom to give your teeth a good brush. Not only does this combat bad breath but it also makes you feel refreshed too, as well as obviously cleaning your teeth. 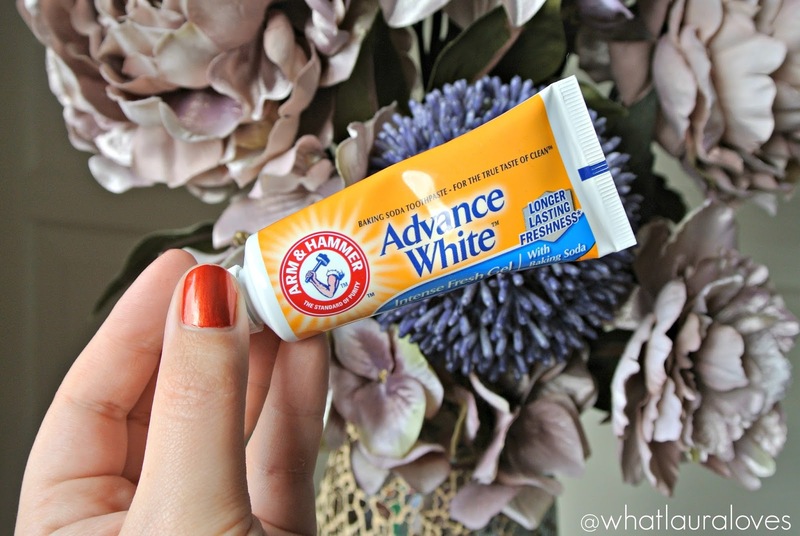 The one that I’ll be taking on this trip is the Arm & Hammer Advance White mini toothpaste which I chose because I’ve used the full size in the past and it worked really well for me. It cleans my teeth incredible well and leaves a really fresh, minty taste in my mouth. The taste is pretty intense which is exactly what I’ll be needing after such a long flight. This is a 25ml size which will be more than enough for my trip to Poland in a few weeks and my trip to Mauritius after that. I tend to just keep this travel size in my hand luggage as it complies with the sizes set by the airline and then I like to take a larger toothpaste with me in my suitcase as I find that this size isn’t quite enough for me to use on a two week holiday, although it is ideal for a one week trip. So that’s my three essentials for a long haul flight- a moisturising skincare routine to keep my skin hydrated, a fragrance atomiser to freshen up and a travel sized toothpaste to keep my teeth clean and my breath smelling fresh. What are your long haul flight essentials? Oh, I'm so jealous (in a good way) that you're going to Mauritius! I have always wanted to go there. My cousin & his wife went on their honeymoon and I couldn't believe from the photos how gorgeous it is. And how smart is that brand Air Repair to come out with travel size products to use on board or at your destination. I'm a big fan of Travalo but I had no idea they made one with a removable interior. Fabulous. Great post! Mauritius is lovely, I am sure you will love the place. I love flying, short hail and long haul, but the latter excites me even more. My essentials are chewing gum, a little bag with toothbrush, toothpaste, some painkillers, moisturiser and my make up bag. I like to be make up free on the plane, but like to put some make up on before landing. When I travel long haul, I like wearing leggings, a blouse and a cardigan when I feel cold. I also like to take my own pillow with me. I am so absolutely JEALOUS ! You are going to have a wonderful time. And you have some awesome travel goodies packed for sure!!! Have so much fun on your trip girl!! I'd love to go Mauritius, it looks beautiful. These are deffo essentials. I always need toothpaste, a change of undies and some kind of perfume or body spray. I even take them on short haul flights as I like to be fresh once I land. Posts like this make me feel like going on holiday. The lip quencher sounds great I might give that a go, thanks for posting. The Air Repair kit looks great. Some of my key essentials are toothpaste, wet wipes and moisturizer. Have a fab time in Mauritius! I haven't been on a long haul flight in years, I think mine was a book and loads of sweets – I dread to think how much stuff I would need to take a toddler on a long haul flight!! have a lovely holiday, I do like the look of the travelo, I always take a pack of baby wipes because they are great for cooling down on the plane too. ah I'm a little jealous of your winter sun getaway! How great that these products come in the right sizes and in a little bag for getting through security – brilliant. I'm incredibly jealous about where you are going! Hope you have an amazing time. The air repair products look really innovative, my skin gets really dehydrated when I'm flying long haul and my lips take ages to rehydrate.